The article discusses details of our ongoing collaboration with Minster. The custom equipment Minster designs for Larson allows us to keep our technologies updated, maintain a comprehensive manufacturing environment, and offer a diverse portfolio—all of which helps drive our continued growth. Minster spoke with Chuck Cederberg, Larson’s President, and discussed the competitive edge working with Minster gives Larson. Ray Niquette, Director of Engineering at Larson, spoke extensively about the Minster presses at Larson—and Minster’s ability to build the production equipment exactly as Larson requires it. Larson—and our customers—gain the benefit of production efficiencies, expanded capabilities and capacity, and consistent quality. 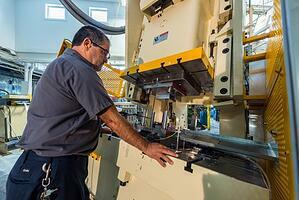 Larson has nine Nidec Minster presses in our facility—ranging from 66 to 450 tons. These progressive, deep draw, blanking, and secondary operation presses allow us tremendous manufacturing capability and capacity for our precision metal stamping customers. 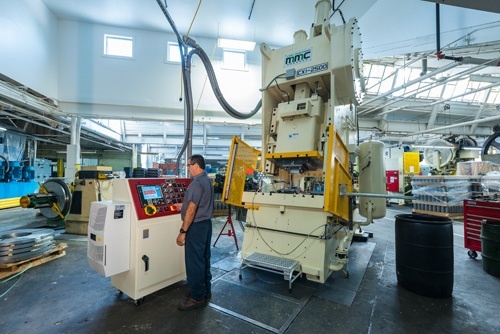 A recent collaboration involved a custom Nidec Minster MMC CX1-4000, 440-ton capacity inclined gap press needed for some demanding applications. The acquisition of this press is aligned with our aggressive growth strategy that includes these new, advanced technologies. Nidec Minster discusses this in more detail on its website. Be sure to check out the video with our Nidec Minster presses in action on our production floor.